Policing in Punjab is set for a revamp with an online delivery system being put into place within a month that will allow the submission and verification of complaints at the flick of a button. Lakhs of rotten wheat bags in open godowns of different villages of Fatehgarh Sahib are emanating unbearable stench after recent rains. Punjab Chief Secretary SC Aggarwal today admitted that constraints of funds have hampered the flood protection measures, required to be undertaken, before the start of the monsoon season, by the Departments of Irrigation and Drainage. Deputy CM Sukhbir Badal today issued instructions to the district administration to expedite relief operations as flood water had started receding in the state. Sounding satisfied after a meeting with Union Finance Minister Pranab Mukherjee in New Delhi today, Punjab Finance Minister Manpreet Singh Badal said the former had given an assurance to resolve the fiscal troubles being faced by the state. Falling short of time to deliver on its promises, the Punjab BJP will now undertake development as per the wishes of its legislators. The state-level authorities of the Department of Rural Development and Panchayat have removed 112 administrators of different panchayats in the state in one go as their appointments were made without following the proper procedure laid down in the Punjab Panchayati Raj Act, 1994. The state government has not sanctioned even a single rupee for the repair (maintenance) of the canals in the state during the past two years with the result no work has been undertaken to desilt the canal banks. Taking serious note of complaints being made by people of Ferozepur that they had been suffering on account of the consumption of underground water, which has been allegedly polluted by the Sutlej, a team of the Punjab Pollution Control Board (PPCB) led by its Chairman Rajat Aggarwal yesterday toured various places and collected water samples for laboratory analysis. About 84 per cent of the farmers in the state want that the arhtiya system should be abolished. And 93 per cent of them are of the view that the introduction of the direct payment system in lieu of foodgrains sold by them in the market will be beneficial for them. These are the findings of a study conducted by the Department of Economics and Sociology, Punjab Agriculture University. Keeping in view the increasing demand of improving medical facilities and the need of better infrastructure, Rajindra Hospital, Patiala, has begun the work of renovation and upgradation of the emergency ward. The much-publicised 1989 Rajiv Gandhi-Benazir Bhutto accord has almost been lying defunct as the Indian Hindu pilgrims have been shunning their visit to the famed Katasraj shrine in Pakistan for past about two years for apprehension of attack by the fundamentalists and for alleged absence of proper security cover there. 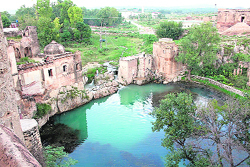 A view of the Katsraj temple in Pakistan. The climatic changes, including the shrinking of ice glaciers has forced the Himachal Pradesh Government to explore the possibilities of setting up a thermal power station in the state after it started facing power shortage as its hydroelectric projects have been getting less waters from its rivers for the past two years. The Hari Ke bridge, constructed over the confluence of the Sutlej and Beas, has become a nuisance for motorists, as potholes and cracks have developed on its upper layer, which have become a major source of road accidents. It is the only link between Tarn Taran and Amritsar on one side of it and the Ferozepur on the other. Justice Surya Kant of the Punjab and Haryana High Court yesterday directed the attachment of salary of Pepsu Road Transport Corporation’s managing director and other class I officers. Former deputy speaker of Punjab Vidhan Sabha Bir Devinder Singh demanded transfer of DEO (elementary), following allegations of sexual harassment by a volunteer of the Education Department against one of the employees of the department. Taking note of the plight of government school students in Punjab and Haryana, Chief Justice Mukul Mudgal and Justice Ajay Tewari of the Punjab and Haryana High Court today directed the Education Department to file affidavits on the existing infrastructure in schools. Just over a week after Delhi businessman Ashish Kumar created a flutter in the Punjab and Haryana High Court by claiming that Punjab vigilance chief Sumedh Singh Saini was out to eliminate him, Justice Daya Chaudhary today quashed non-bailable warrant issued by a Ludhiana court against him and his mother Amar Kaur. Punjab is weighing the pros and cons of replacing the stamp paper system with alternative fool-proof system, but the livelihood of stamp vendors was also one of the concerns. This was asserted by the state of Punjab in an affidavit filed in the Punjab and Haryana High Court yesterday through under secretary, Department of Revenue, Rehabilitation and Disaster Management, Hari Singh Sodhi. The main accused in the Shingar blast case, Harminder Singh, was arrested today by a special team of police with three others. The police recovered heavy arms and ammunition from their possession. The online delivery system will also be available to those who do not have access to the internet service. The state will establish kiosks at its community policing centres as well as at public places to ensure people are able to avail themselves of the service. Giving details of the system, Punjab Governance Reforms System Chairman Pramod Kumar said Home Minister Sukhbir Singh Badal had given his assent to the proposal to introduce the online delivery system. Explaining how the system will work, he said all complaints would be processed at the police headquarters here, which will act as a centralised complaint receipt centre. He said linkages would be created between the headquarters and the community police stations at the district, subdivision and police station levels so that complaints could be despatched to the relevant police stations. “Once this is done, complainants can check the follow-up on the complaints”, Dr Pramod Kumar said. This follow-up could include whether an FIR had been registered on the complaint, if it was being investigated and at a later stage if a challan had been presented in the relevant court or not. Deputy CM Sukhbir Singh Badal, when contacted, said the online system was being introduced as it was felt that in many cases women and even urbanites were reluctant to approach the police station with their complaints. He said in some cases it was difficult for people to keep tabs on their complaints. He said besides facilitating people the system would also bring about transparency in police functioning, as personnel would have to list the exact status of each case within definite timeframes. Meanwhile, according to figures available with the Reforms Commission, in a sample year against 2 lakh complaints received by the police only 58,000 cases were registered. He said out of these FIRs investigation was conducted only in 65 per cent of cases and chargesheets finally presented in only 30,000-odd cases. Dr Pramod Kumar said a survey indicated that the disposal rate, particularly in the case of vulnerable sections of society, was low. He said the government had agreed to the commission’s proposal for a dedicated cadre for the investigation of cases, as this was a specialised activity. He said a monitoring system also needed to be put in place besides creating an institutional system at the police station level which could be linked with experts in auditing, banking, criminology, revenue and forensic science to speed up investigations. Villagers of Ranwan, near Khamano, and Kotla Bhaika in Sirhind are suffering due to the lakhs of rotten paddy and wheat bags lying in open godowns for the past many years. Nearly 2.5 lakh bags lying in Kotla Bhaika are creating nuisance for the villagers, who have stopped visiting the surrounding areas of the open godowns fearing ailments. A visit to the godown in Kotla Bhaika revealed that most of the wheat has got damaged, on which insects could be seen moving. “We have covered all wheat bags with plastic sheets, but most of its lower layers have got completely damaged during recent rains and water has still not evaporated from these bags,” said one of the workers in the godown. The workers said the wheat was rotting for the past three years and every year during monsoon the percentage of damage increases manifolds. “We have been spraying medicines and uncover the bags during sunlight, but the entire lot seems to have got damaged during these years,” they added. “Due to the foul smell emanating from the rotten wheat bags, no passersby could walk through the road without covering his face,” said Preetam, a resident of a nearby village. The railway employees and few workers in the godown are the worst affected, as the godown is situated adjoining the railway crossings. “We feel like running away from the place during night hours, as insects and mosquitoes increase manifolds, when it gets dark,” said Sulakhan Singh, an area resident. MD Punjab Agro SK Sandhu, admitting the problem, said he had visited the place last week and they were planning to shift the entire lot of the wheat bags to some other place due to the delay in its lifting. “Process of segregating the good grains from the rotten is on and many of these bags have been removed from the godown. The damaged foodgrains will be auctioned and action has already been initiated against the erring officials”, he said. Candidly admitting that the state government could not provide enough funds being demanded by the Drainage and Irrigation Departments for undertaking various works for flood protection, Aggarwal after visiting flood-hit areas of three districts - Sardulgarh in Mansa, Moonak in Sangrur and Patran in Patiala - said: “Due to resource constraints, it was not possible for the state government to disburse the funds sought by the above said departments. It is true that funds being provided to the Irrigation and Drainage Departments were much less than what they asked for,”Aggarwal said. But the government was really not in a position to meet the demand,” he said. While expressing satisfaction over the relief measures, Aggarwal further said a team of Central government would be visiting the flood-hit districts of Mansa, Sangrur and Patiala on July 20. The Chief Secretary added that instructions had been given to the district administrations to keep a strict vigil on the vulnerable points and those places where breaches occurred during floods. He also asked the authorities of the flood-affected districts to hold medical camps. When asked about that the Drainage Department even failed to utilise the funds released to them, the Chief Secretary said the government would seek a preliminary report in this regard and if it was found unsatisfactory, then only an inquiry would be ordered. He also issued instructions to the Agriculture Department to activate its extension network to guide farmers in re-sowing operations. The death toll in Punjab floods rose to 25 with two more deaths reported from the Sardulgarh area. The meeting was informed that crops over 3.25 lakh acres had been submerged in the floods. The floods in 1,116 villages had also claimed the life of 25 domestic animals, more than 800 houses, including 75 in Sardulgarh, had been damaged in the floods. Besides, 620 houses had been partially damaged. Bathinda: MP Harsimrat Kaur Badal on Friday launched a campaign to plant 5 lakh saplings of wide-leaf trees during the current monsoon to check the imbalance in the ecology that has caused floods in the state. She distributed saplings, particularly among housewives and schoolchildren, as their involvement in the success of the campaign was necessary. During her “sangat darshan” at Kothe Thande, Kahansinghwala, Joganand, Khialiwala, Khemuana, Har Raipur, Amargarh and Gillpati, she stressed the need for restoring the green cover to meet the challenge of climate change that was posing a threat to mankind. Meanwhile, Raninder Singh, general secretary of the Pradesh Congress Committee and son of former Chief Minister Amarinder Singh, visited flood-hit areas of Mansa district. He urged the government to order a special survey to ascertain the loss of property suffered by members of the weaker sections and provide them relief on a par with those farmers whose crops were destroyed. Joginder Dayal, member of the national executive of the CPI, accused the state government of having done nothing to protect people from the fury of floods. “Punjab is reeling under a huge burden of debt, which is the biggest worry for us. Mukherjee has assured me that he will look into the issue,” said Manpreet. By the end of this fiscal year, the state’s debt burden will cross Rs 71,000 crore. The state government has to pay about Rs 6,000 crore per annum as interest on it. “I have told Mukherjee that there is a debt of Rs 10,000 crore, which is of the period when the state remained under the President’s rule”, said Manpreet. This amount needed to be waived. Besides, there are small-saving loans worth Rs 29,000 crore, which should be rescheduled for payment in next 30 years”, he added. Manpreet added that the Union Finance Minister had assured that he would examine both issues and try to find out some solution to lessen debt burden on Punjab. Manpreet said he was thankful to Mukherjee that he heard the state’s case patiently and promised to do his best to bail the state out from the tight fiscal situation. “He gave enough time to hear the fiscal hardships being faced by the state, whereas the 13th Finance Commission from which the state had high hopes did not give any relief and swept aside all fiscal issues raised by the state,” said Manpreet. He said even the rescheduling of the payment of small-saving loans could help the state in a big way. The issue of purchase tax on foodgrains procured for the Central pool from the state was also taken up with Mukherjee. After the implementation of the Good and Services Tax (GST), the state government could lose purchase tax worth Rs 2,000 crore, which it charged on the purchase of foodgrains. Manpreet said Mukherjee had also assured to look into this issue. The Union Finance Ministry has kept a provision of Rs 50,000 crore to compensate states, which may be adversely affected with the implementation of the GST at the initial stage. Other issue such as industrialisation of the state was also discussed. The BJP is under pressure from its legislators who claim they have not been able to do as much for their constituencies as their SAD counterparts have. Keeping this in mind, the party now wants that its legislators have the final say in the spending of Rs 1,100 crore which the government expects to generate on account of VAT surcharge this year. State Local Bodies and Industries Minister Manoranjan Kalia, who also heads the party’s legislature wing, while talking to The Tribune said the money collected on account of the VAT surcharge was expected to be released to the Local Bodies Department soon. This despite Finance Minister Manpreet Singh Badal claiming that there was nothing in the Sukhbir-Kalia resource mobilisation committee report stating that funds collected on account of surcharge would be handed over to the Local Bodies Department. The BJP has made the issue of transfer of these funds to the Local Bodies Department a prestige issue. About a fortnight ago, it had protested against development work being initiated in urban areas represented by the SAD by the Punjab Infrastructure Development Board (PIDB). Kalia said the Chief Minister had assured the BJP that he would resolve the issue and that action was likely after the latter returned from his trip abroad. “We are concerned about getting the money and this could come from any other kitty also,” he added. BJP sources said the party wants to allocate funds to its legislators so that they can address urgent issues in their constituencies. The funds are likely to be spent on small projects that have a gestation time of six months so that MLAs can reap the rewards in the forthcoming Assembly elections. The SAD-BJP government had earlier already allocated funds to municipal corporations and committees. Sources said the authorities had to take this action as the Punjab and Haryana High Court had taken a serious view of the fact that the administrators of certain panchayats had been appointed in an arbitrary manner by District Development and Panchayats Officers (DDPOs) of various districts without adhering to the procedure laid down in Section 200 of the Act. While dealing with a petition filed by the panchayat of Kot Dharmu village of Mansa against the appointment of the administrator by the DDPO concerned after taking powers from the elected sarpanch, the HC asked the Director (state Rural Development and Panchayat) to examine all cases where administrators had been appointed in place of elected panchayats. To save themselves from inviting the wrath of the Punjab and Haryana High Court, the authorities removed 112 administrators of panchayats in the past four days. Their appointments were made on flimsy grounds and allegedly under diktats of a section of leaders of the ruling SAD-BJP alliance. The administrators appointed by the DDPOs were employees of the Department of Rural Development and Panchayat of ranks ranging from a gram sewak to social education and panchayat officer (SEPO). “The next date of hearing in connection with that writ petition is on July 21. We will file an affidavit that all administrators, who were appointed in the violation of the procedure, have been removed after the DDPOs concerned withdrew orders issued by them in connection with their appointments,” said a senior functionary of the department. He said if it was found that the appointment of an administrator was necessary for conducting the business of any panchayat, where the administrator had been removed now, the new administrator would be appointed by following the laid down procedure. The government has allegedly adopted a lukewarm attitude towards the need to have flood preventive measures as a whole. Even the Drainage Department got Rs 10 crore for strengthening of the Dhusi bundh on the river and cleaning of the drains. Enquiries made by The Tribune said today that the state had a network of 18,500 km of the canal system, which provides irrigation and drinking water facilities. The major canal works are the Sirhind canal system which feeds the Malwa region, Bistoab canal for the Doaba region, Makhu canal system for Zeera, Eastern canal system for the Fazilka area, Sirhind feeder system which caters to the districts of Faridkot and Ferozepur, Shah Nahar system and Kandi canal system which look after mountainous districts of the state, including Hoshiarpur, Gurdaspur and UBDC (Upper Bist Doab Canal) system. This looks after the majha area of Amritsar and Tarn Taran districts. It is learnt that the canal department had sought a sum of Rs 22 crore this year for the desiltation and strengthening of the banks of the canals. But it did not get even a penny. The drainage department, which looks after the drainage system and the bundhs of the rivers, has been undertaking some preventive steps to strengthen the Dhusi bundh on the Sutlej, Beas and Ravi rivers and cleaning of drains. Vinod Chaudhary, chief engineer (drainage), said as many as 76 works on strengthening of the Dhusi bundh were in progress. They had also cleaned the major drains, he said. Chaudhary said they had a proper disaster management plan for the state as a whole and control rooms were functioning at the district headquarters. The team took water samples from the Sutlej at the point where it enters Pakistan and where it re-enters India after covering a vast area in Pakistan. DC KK Yadav accompanied the team. “We have been receiving complaints that leather tanneries based in Kasur (Pakistani town) have been polluting the Sutlej by discharging into it their untreated industrial waste,” Aggarwal said. A comparative laboratory analysis of water samples taken from the point where the Sutlej enters Pakistan and those taken from the point where the Sutlej entered India will reveal the real cause of pollution, he said. The BSF authorities had been requested to inform about the discharge of the polluted water in the Sutlej by the Kasur-based tanneries near this village to the district administration, Ferozepur. Yadav said the water samples collected today from different points would be analysed in the PPCB laboratory in Patiala. The analysis would also show whether there metal content was present in the water or not. A copy of the study, conducted by Dr Sukhpal Singh and Tejinder Kaur Dhaliwal, has also been given to the Punjab Mandi Board. It is one of the most important studies ever conducted by the university as it breaks certain generally held opinions by the state government and others concerned. For instance, the state government did not introduce the direct payment system on a plea that most of the farmers were not in favour of it, as they did not have bank accounts. However, the study claims that 93 per cent of the farmers contacted by the university were in favour of the system. Moreover, 77 per cent of the farmers have bank accounts and 98 per cent families of farmers deal with banks in one way or other. Such a high proportion of 98 per cent refute an argument often advanced by arhtiyas that payment through cheques should not be made to farmers because of problems being faced by them while dealing with banks. 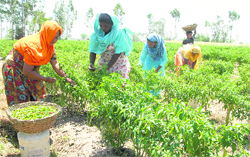 Supporting the direct payment system, farmers said they would not only get full payment of their produce sold in the market, but also be freed from the clutches of commission agents. They would also be able to withdraw money from banks on need basis. At present, the annual payment of commission to arhtiyas is in the range of Rs 780 crore. To give a facelift to the emergency block and to improve the facilities, the district planning board has given a grant of Rs 35 lakh to the hospital for the renovation and installation of new machinery. Chairman of the board Surjit Singh Rakhra issued this grant. Meanwhile, emergency block is undergoing this change after 56 years. Medical Superintendent of the hospital KD Singh said the emergency was almost ready and the patients could start availing the facilities within seven to 10 days. The emergency was now equipped with the best facilities, from the modern beds to the latest machineries, making it one of the best in the area. The emergency block would have a trauma centre, surgery, biochemistry lab and medicine sections. Each bed will be attached with oxygen plant and side monitors. Dr Sudhir Aggarwal, who has been looking after this work, the authorities would first give trials to the staff members as the machinery was new said after the emergency block was ready. Also the old electricity supply has been replaced by a new electricity system in order to ensure that there were no more problems because of overloading. Earlier, there were instances when the electricity would be disconnected due to one problem or the other. This system has been changed with an investment of Rs 2.5 lakh. Meanwhile, the All-India Hindu Shiv Sena, headed by Surinder Kumar Billa, who has also been organising jathas of Indian Hindu pilgrims to Katasraj, has asserted that the Indian Hindu pilgrims would visit Katasraj only in case, appropriate security cover was provided to them by the Pakistan government. “External Affairs Minister SM Krishna should take up the matter with the Pakistani authorities immediately or the accord should be scrapped,” asserted Billa. The bilateral accord facilitated opening of pilgrimage of the Hindu and Muslim pilgrims to shrines in both countries like Katasraj in Chakwal district of Pakistan, shrine of Hazrat Muin-ud-Din Chisti in Ajmer, Hazrat Nizam-ud-Din Aulia in Delhi, shrine of Hazrat Aamir Khusro in Delhi and two other famed shrines in Sirhind and Kalyanpur in the first place. Subsequently, while the Indian side had agreed to open shrine of Hazrat Hafiz Abdullah in Agra and another shrine for 150 Pakistani pilgrims every year at each of the two shrines. Pakistan had reciprocated by opening Sadhu Bela shrine in Sakkhar for Indian Muslims and another Lahore-based shrine for Indian Muslims. While, the Indian government was allowed to increase the annual number of the Pakistani Muslim pilgrims, the Pakistani side preferred to retain the old number of 400 Indian pilgrims for their visit to Katasraj. “While the Pakistan government has off late been providing full security to the Sikh pilgrims, it is not in case of the Hindu pilgrims, who fear backlash of the fundamentalist elements during their Katasraj visit. That is why the Hindu pilgrims have not been going on the Katasraj yatra since 2008. The Indian government needs to take up the issue with Pakistan so as to enable Hindu pilgrims’ visit Katasraj,” demanded Billa. He said the last jatha of the Indian Hindu pilgrims had gone to Katasraj on occasion of Shivratri in 2008. What has necessitated the state government to take this decision is that apart from meeting the ever-increasing demand of its own consumers, the government is bound to honour the contracts with other states to sell them electricity during the summer season, failing which it will have to face heavy penalties. During the current season, the HP government faced problems on account of power shortage and residents had to face power cuts. The disturbance, which occurred during snowfall and snow-melting period, made the rivers to carry less water and, hence, it affected the functioning of hydro electric projects. “By running a thermal power plant, the state will get enough power to meet its own demands and to honour the commitments made with other states in case the hydroelectric projects suffer on account of less water in feeding rivers,” he said, adding that the thermal plant might be set up in the Nalagarh area of HP. Sources said premix carpeting of the bridge could not be carried out for the past many years despite the fact that the bridge was very important for defence requirements of the country. `A section of people, who pass over this bridge frequently, said it took about 15 to 20 minutes for a vehicle to pass over this bridge. Kulwinder Singh, SDO, Irrigation, Hari Ke wing, said though the bridge was strong, the potholes and other cracks had been disturbing the smooth flow of traffic. He added that the Irrigation Department had been writing frequently to the PWD (national highway) wing to carry out repair on it. A senior functionary of the PWD (national highway wing) said they had prepared an estimate to carry out the repair. But the road section from Amritsar to Bathinda, on which this bridge fell, was taken over by the NHAI and hence it could not be repaired. He said the Secretary and Chief Engineer, PWD, had taken up the matter with the NHAI for handing over the command to the PWD (national highway wing) again. Addressing a press conference yesterday, Bir Devinder alleged that a poor girl deployed in school of Badesha Khurd village, near Khamano, was molested by one of the employees of the Education Department in the department itself few days back. Now, the DEO is trying to hush up the case. A case in this connection has already been registered against the accused employee Jasdev Singh at the Fatehgarh Sahib police station. Bir Devinder demanded shifting of the DEO, so the police could conduct a fair enquiry. He stated that complaints in this regard have been lodged with the Education Minister and the matter was brought into the notice of the senior SAD leaders. While demanding a fair probe into the allegations, Surinder Singh alleged that Bir Devinder was unnecessarily giving a political colour to the case. He pointed out that the girl was shown the door after she was found absent from duty for many days. She also provided two incorrect medical reports and a departmental enquiry was also conducted by the senior officers. The directions have their genesis in a news report carried in these columns. Taking suo motu cognisance of a Tribune report on poor amenities to the residents of Chhapar Chiri, the Chief Justice had directed the matter to be treated as a petition in public interest. Notices were also issued to the state and other authorities. As the case came up for resumed hearing, the Bench took cognisance of another news item carried on July 16 in these columns about the students of Amlala village and Dera Bassi being housed in unsafe buildings. The Bench observed that taking into account enormity of the problems faced by the students of government schools, it was of the view that enlarging the scope of the petition would be appropriate. Accordingly, the states of Punjab and Haryana through the Department of Education are directed to file affidavits giving details of the present state of infrastructure in the schools, the Bench added. Laying down the parameters, it asserted that the affidavit should give details on the safety of buildings housing students. It should also elaborate whether there were adequate toilets, drinking water facilities, sufficient classrooms and enough fans. The details of power supply were also sought. The Bench made clear it wanted details of mid day meals and the number of working days the teachers were utilising on non-working activities. Ashish Kumar has all along been saying that his brother Vinod Kumar, brother-in-law Ashok Kumar and their driver Mukhtiar Singh were kidnapped and later eliminated; and the CBI found Saini and three other police officials directly responsible for their disappearance. His family was the chief financier to Saini motors run by the divorced husband of Sumedh Singh Saini’s sister; and the Ludhiana case was an offshoot of their struggle for justice, Ashish Kumar has been asserting. Amar Kaur is virtually the complainant in the disappearance case against Saini. With the quashing of the warrants, Ashish Kumar will appear before the Ludhiana court on the date already fixed for hearing - August 17 and admitted to bail. The petitioner has been given the liberty to file a fresh petition for transfer of the Ludhiana case to some place outside Punjab. Appearing on Ashish Kumar’s behalf, his counsel Sanjeev Bansal said in the present case, they were not laying stress on the allegations against Saini. Bansal, on the previous date of hearing, had alleged that attempts to arrest Ashish Kumar were being made after the Delhi high court ordered for day-to-day proceedings in the case against Saini. While police officials refused to divulge any details regarding the arrests, however, sources said some arrests had been made in this regard. They said a press conference in this regard would be held tomorrow in the presence of Punjab DGP. The police had also announced a cash prize of Rs 5 lakh for providing information about the main accused in the blast case. Sources in the police said the accused were arrested from the Janta Nagar area of Ludhiana. Police officials on a tip-off raided the house in which the four accused were residing for the past some time. Officials said Harminder tried to escape by jumping from the rooftop but was nabbed later. He also received some injuries. The sources said one AK-47, 2 pistols, hand grenades and large number of live cartridges had also been recovered. The accused had been brought to CIA, Khanna, for interrogation. The sources added that the other three accused hailed from Patiala. Six persons were killed and 25 seriously injured in the Shingar cinema blast and subsequent stampede in Ludhiana on October 14, 2007.